It could never be said Kim Kardashian isn't experimental when it comes to fashion. Countless times the fashion chameleon has pushed the style boundaries, from sporting underwear as outerwear, to single-handedly attempting to bring back Adidas popper tracksuit bottoms by teaming them with a lace body in an outfit that deservedly got the meme treatment. But although she loves to shock us with her fashion choices, she's usually pretty conservative when it comes to her beauty looks (apart from the bleached brows but she's only human,) sticking to her go-to contoured base and smoky eye. Until now that is. Out of nowhere Kim has gone all futuristic on us and upped her gel game with a full set of heavily PIERCED nails and we don't know what to think of them. While the sky is the limit for nail trends (botanical, wired, chocolate - you get the idea) could this be a look that really catches on? In a matte purpley-silver, the long false talons have multiple mini gold hoops attached to the tips that we can't imagine will make changing Saint's nappy easy. 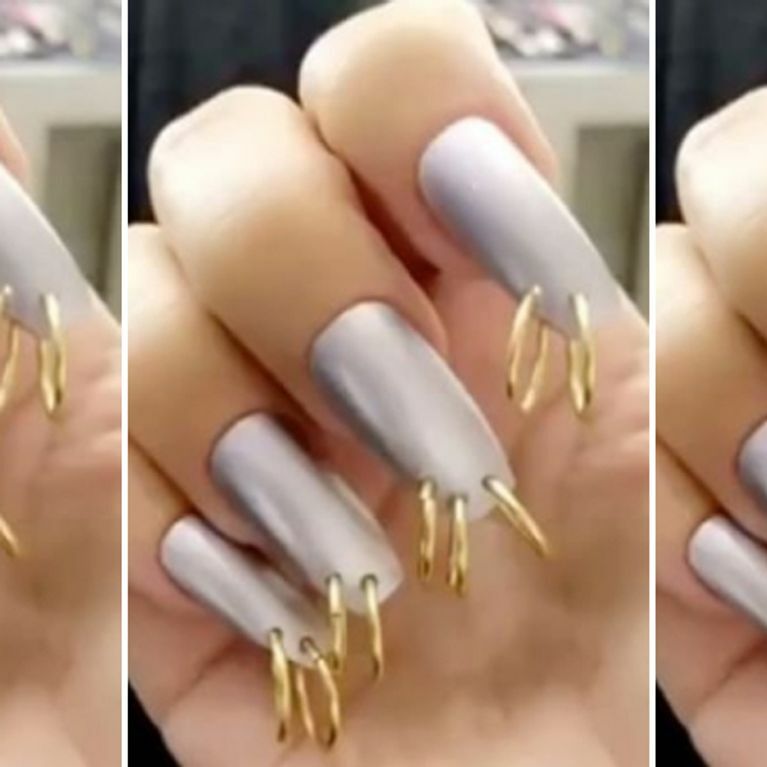 And while Kim may think she's started something new, the Nineties' kids among us will know this isn't the first time pierced nails have been a thing. Victoria Beckham was the original trend trailblazer back in her Spice Girls days. Don't pretend you didn't think she was uber cool and even debated getting one, too - much to your parents' and teachers' disgust. Where the Kardashians go we follow, (apart from the poppered trackies - they will forever stay in the past where they belong) but ​the jury is out on whether we'll be adding this crazy look next to berry lips, tousled hair and iridescent everything on the list of Nineties beauty trends that have made triumphant comebacks in recent times. ​However, if you do fancy dipping your toe into the pierced-nail trend without going all out Kim Kardashian, you could try a look nicknamed 'the Chandelier Nail' featuring a couple of hanging charms a la Fyodor Golan on the SS17 catwalk, created using ORLY polish. Pretty and way more washing-up friendly? Now that's a nail trend we can totally get on board with. Kim Kardashian dyes her hair blonde for new mum make-over!